The LOST ARGs: UK LOST Marathon - World Record ? 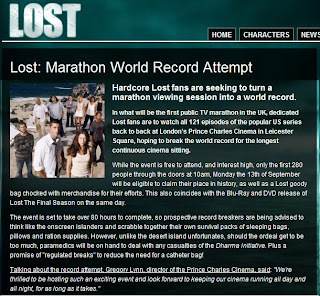 This article from the UK Sky1 LOST site mentions that the LOST Marathon starting on Monday could possibly be a world record attempt. 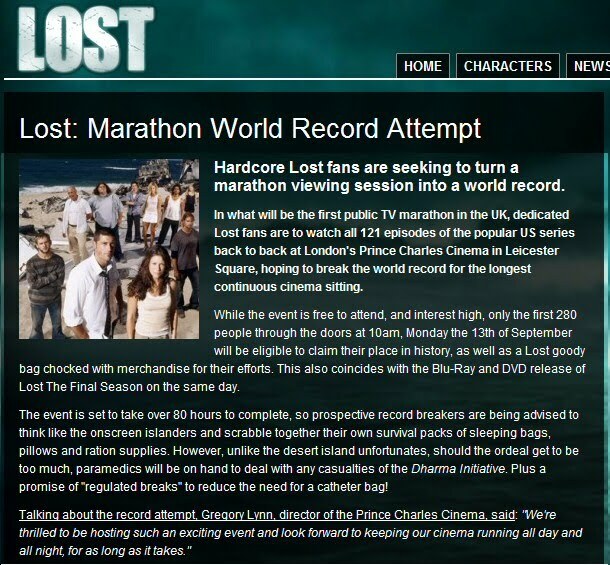 The Marathon is being held to celebrate the release of Season 6 and the complete collection of LOST on Blu-Ray and DVD on Monday 13th of September. There are lots of our fellow losties going to the marathon and Lottery_Ticket has set up a Twitter List following some of them. So all that is left is for us to wish everyone attending good luck and tell them to take plenty of DHARMA goodies to keep them sustained. That Roger Workman look after the purge isn't a good one. So do you have to stay awake for the full 80+ hours to be able to claim a world record...? 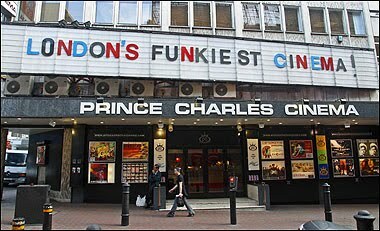 Best of luck to all our UK LOSTies! Please send all the Tweets, Pics, videos that you can for us! Patmc, you don't have to stay awake, but you can't leave and get back in! so I hear. follow the list. 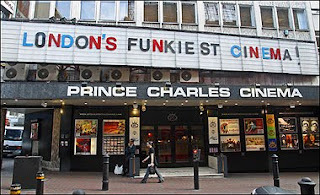 pics are starting with @Lost_4815162342 cosplay for "Charlie Season 1"
"Wishing everyone in London at the Prince Charles a safe marathon. I won't be offended if you sleep thru the beginning of Season Three." Go Damon! Though, I'm currently watching Season 3 right now and I must say, it really isn't that terrible. The flashbacks aren't as strong but the island stories are still just awesomee. Thanks to Zort for continuing to post stuff like this. I come back here every so often to see who still cares about L O S T. I will always be LOST.